Subdural haemorrhage. 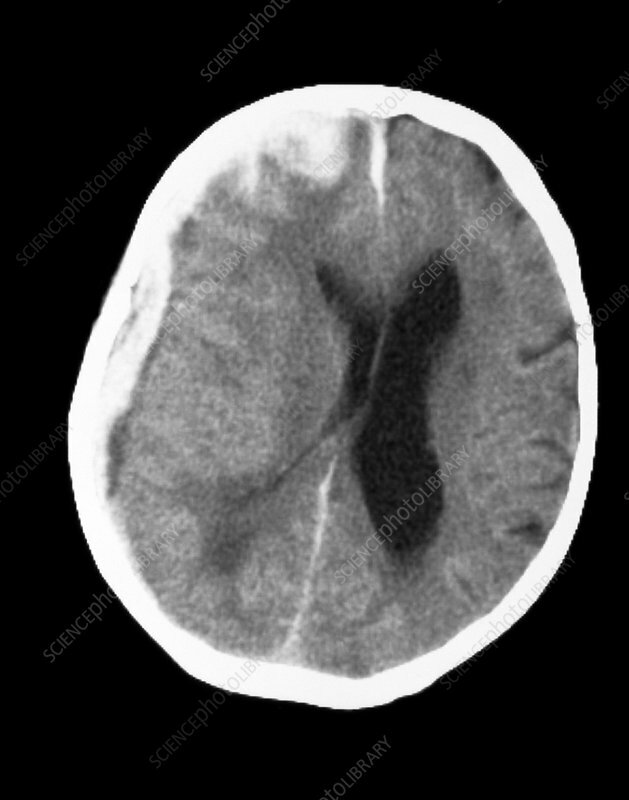 Computed tomography (CT) scan showing right subdural haemorrhage (haema- toma) around the brain. At left, bleeding can be seen between the skull and cerebral brain tissue. This bleeding has extended to top left. Pressure of blood exerted on brain tissue has compacted the shape of the ventricles (at centre). Subdural haemorrhage is bleeding that occurs in the space between the dura mater and arachnoid brain mem- branes. The trapped blood forms a blood clot, causing symptoms of headache, drowsiness and even paralysis. Surgical treatment is by draining the blood clot and repairing damaged blood vessels.